Here’s something different. From the brewery that has brought you Imperial Pumking Ale, 2XIPA and 2XStout comes a brew inspired by Swedish Glögg. This is probably the end of the Scandinavian theme we sounded two days ago with the Nogne Ø Winter Ale. Glögg is a mulled wine—a warmed concoction of wine, brandy, fruits and spices, more or less the same mix used here—ginger, cloves, cinnamon, orange peel, cardamom and crushed figs. Southern Tier adds four varieties of malts, and two kinds of hops (not sure what kind and I can’t call on a Sunday). But the brewery suggests the beer would be better chilled than warmed. “Mint!” my wife cried when I had her take a whiff. While I don’t think there’s any Mentha involved, the aroma is a little like heading into the resort spa for a eucalyptus treatment. Probably a heavy hand with the cardamom, though it’s appealing to me. Those I was assuring yesterday about the barely noticeable spicing in Samuel Adams Winter Lager should run the other way today. This one’s all about the spicing, and you’re liable to turn your thumb up or down accordingly. It’s thumbs up from me. The spicing mix strikes me as unique, and having had plenty of beers with all the ingredients save the figs, I’m giving all credit to the figs. While the exotic spicing remains the predominant flavor characteristic throughout, it’s amply carried along by the honeyish malts, and all in all makes for a stunning Christmas package. 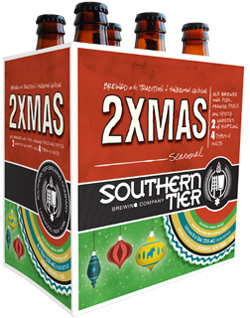 Southern Tier is only ten years old, but has grown by leaps and bounds since its modest 2002 beginning. Radiating from brewery headquarters in Lakewood, New York, south of Buffalo near Lake Erie, the beers are now in more than half of the U.S. states, heading out to the Dakotas and leapfrogging to Oregon, Washington and Alaska. 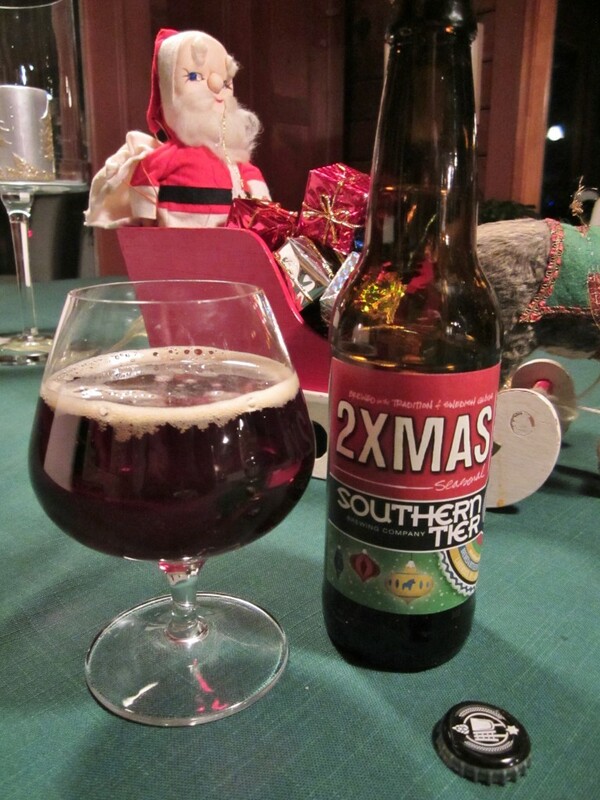 The 2XMAS is new this year, maybe because the brewery needed to get its spicing act on. Since 2003 it has annually produced Old Man Winter Ale, a 7% ABV warmer without any extras–a beer now definitely on my must-try list. But the annual Imperial Pumking already proved Southern Tier was not timid about opening wide the spice chest. It’s not only one of those pumpkin pie spices beer, it’s one of those pumpkin pie spices beer with the whipped cream on top. (Actually, some vanilla, buttery crust and roasted pecans.) I’m not normally a big fan of the style, but Pumking was so over the top it seduced me pretty handily. Since that seems to sum it up, let’s end with our Scandinavian toast once again: Skål! God Jul! Availability: From late autumn, in about half the U.S. states. Southern Tier has many solid beers, but they seem to really kill it with their seasonal offerings. They seem to do sweet – or some version of that flavor – really well. Sometimes to a fault … coughCREMEBRULEEcough. Glad you liked this one. It’s a great holiday brew. I know what you mean. I think Pumking is way over the top. And yet, I found it compellingly drinkable. Enjoy your blog–check it out, folks.